About E-Hunter is a small hagwon that not only focuses on the basics of english, but also teaches english through weekly activities like cooking, art and science. Classes are very small (maximum of six children) to ensure each child has ample time with their english teacher. 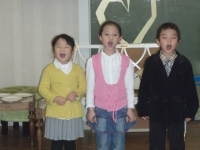 Children are taught grammar basics with a Korean english teacher and they are taught their weekly activities as well as conversation and writing with their foreign english teacher.